I used to be pretty maniacal about checking my credit scores when I first got into this game. After a year a so when I realized my scores weren’t really changing, I calmed down and sometimes I now go a couple months without checking. I’m sure everyone knows that you can use Credit Sesame and Credit Karma to check your “fako” credit scores. Short version – both these sites spit out a “score”, though it’s not the actual credit score reported by the credit bureaus it just is an estimated score based on an algorithm. The most useful way to use these sites is to monitor how your score is fluctuating as opposed to the absolute number (in my opinion). 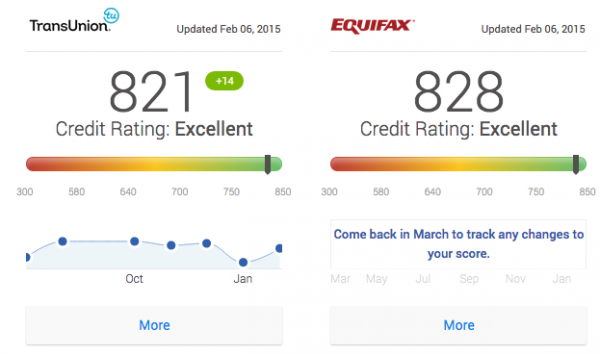 I logged in to see how my scores are doing and noticed that Credit Karma now gives you two scores – one based on your Transunion credit report (which they had always done) and one based on your Equifax report (new!). Not a game changer, but pretty useful nonetheless – now you can get fako scores for all three credit bureaus since Credit Sesame estimates your Experian score. Apparently they made this change in late December, but I never got the memo. ALSO apparently I could have gotten my Equifax score from mint.com but I haven’t logged into that site in over a year. 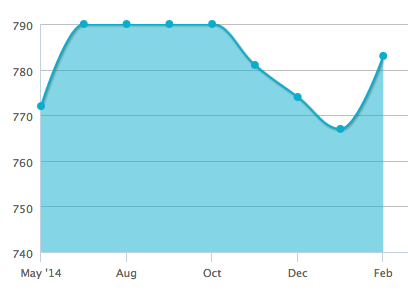 Maybe nobody cares about credit scores anymore. Anyway, even though I’ve gotten lax, I would recommend signing up for at least one of these sites to monitor credit from time to time – not only is it good for your game but it also should alert you to any possible breaches. Also, now’s a good time for a friendly reminder that if you can’t pay off your balances in full every month – the miles and points game is not for you. Safety first. Introducing the Saverocity Observation Deck Podcast!